We all have our different opinions on all of the video games that are released every year. One person might love a particular game while the other person might not. For me, I always like to see why they might not like the same game that I do so I can better understand their opinions. Sometimes I fail to see why people hate it, but other times, I can totally see where they are coming from. To each their own, I say, but knowing how people sometimes act when you disagree with them, we might never find peace among opinions. One of those games that is causing such a situation is Namco Bandai’s Project X Zone. 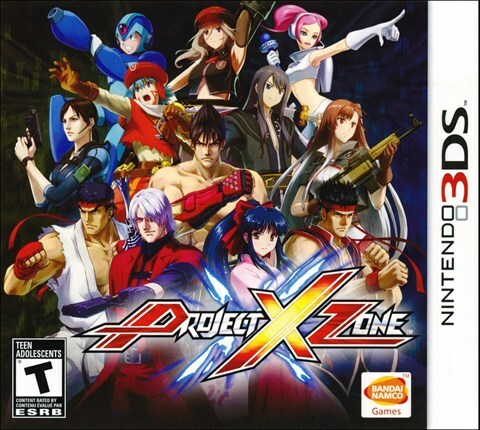 What is essentially a sequel to Namco X Capcom, Project X Zone is either liked by gamers or not. I have seen both sides of the argument, and you can stick me on the side with gamers who like this game, because as of right now, it is the best 3DS RPG experience, until we get Mario and Luigi Dream Team next month. The game that combines Capcom, Sega, and Namco characters is definitely worth checking out, but why? Read on to find out! The story is about a private investigator/ninja (awesome sounding job) named Kogoro Tenzai. He is helping a young woman named Mii Kouryuuji, who is also trained to use highly dangerous weaponry. Anyway, Kogoro is helping Mii with a case about a sacred stone called the Portalstone which was stolen from Mii’s mansion. After that, chaos ensues! Different worlds and realities start mixing together with characters from Namco, Capcom, and Sega, all clashing or joining forces to stop whatever force stole the stone in order to rule all dimensions and worlds. I have talked to some people who have made sense with what happens in the story and how it relates to Namco X Capcom. For me however, and probably many others, I didn’t pay too much attention to how all of what happens in the story, well, happens. I actually found it more fun to see how the characters from different franchises and companies worked off of each other. The dialogue is what makes the somewhat confusing story enjoyable, since not one character is left behind in the story and each one has a line. I just think it would be hard to explain what exactly happens in this story. It’s like if the Marvel vs. Capcom franchise actually had a story. How would you make a sensible story with all of the characters coming together? The gameplay is where Project X Zone shines. It is an action/turn-based/tactical-RPG. The setup of the battlefield is very similar to games like Final Fantasy Tactics. You move units consisting of two characters and one assist unit across a grid-like battlefield. If you are in range of an enemy, you go into battle. The player is then taken to a 2D battlefield where you are given a certain amount of attacks to wail on the opposing enemy. The combat is very similar to Namco X Capcom, so if you have somehow played that game, you will get this game’s combat down right away. While you are using said attack points, you can call on an assist attack or a support attack from another unit that is nearby to damage the enemy. If your EXP bar reaches 100%, you can pull off a very special and huge damage-dealing super move onto said enemies or boss. A lot of people and critics have said that the combat is very shallow. Well, it sounds to me like they didn’t play it that much, because there is a subtle sense of strategy that the combat offers. If you keep juggling the enemies in the air with the attacks, it does more damage. This is especially a helpful technique, since bosses and certain enemies have block meters, and you really don’t want to have that block bar back to full and wasting attacks. It also helps when you are facing against these kinds of enemies to choose an attack that will automatically break the block bar and send the characters flying into the air. The strategy can be even deeper if you choose which assist unit goes with which main unit, since pairing up one assist character with a different unit might help that unit do more damage on the enemy. So yes, if you do not learn the details of how the combat actually works, you can see why people call it a button masher, but the game becomes much deeper when you put in the ideas of juggling enemies, equipment, and which assist character to be put into which unit. The game will take you a good while to beat since, well, it is an RPG. There is no multiplayer, but with how tactical RPG’s play, I think multiplayer would just be a snooze fest. The graphics are great. The characters are well detailed, drawn, and animated. Sure, the battlegrounds might not be on par with how the characters look, but it fits the tactics game look. The individual character movements are just fun to watch, even if the battle onscreen can get quite chaotic with so much stuff flying around. Surprisingly, there was little-to-no slowdown, which is impressive. The music is also very well done. I found myself humming the tunes after I played the game, and that’s always a good sign. I think the developers, Banpresto and Monolith Soft did a great job with the presentation. I know some people are going to be like, “why didn’t this character show up” or “why didn’t these characters get picked”, but you know what? This game was probably already a pain to push past the pitch, due to how much legal limbo all three of the companies would have to go through, and having the characters you wanted probably would have just been more work. Maybe if you all support this game, we will get a sequel with the characters you all wanted. So, what is wrong with this game? It seems like a crossover fan’s fantasy to have a bunch of characters from different companies fighting to save the world! Well, there are a few issues. I do think while the character roster is a bit smaller compared to Namco X Capcom, it is more human-centric. While I don’t mind this, it does make you wonder why they didn’t choose other non-human-looking characters. I also wish the battles went a little faster. I say this because later on in the game when you have more units to control, the game will throw 20 or so enemies on top of the enemies you are already fighting, which can bring the game to a slower pace than before. I also wish there was a choice to take the assist characters or “solo units” and make them their own unit. Would you sacrifice more attacks for more units or vice versa? To add onto the combat, I wish the fights, for the most part, weren’t so one-sided. You can basically wail away at the enemy and they do such little damage to you, unless they are a boss. They could have easily done something like Namco X Capcom or Eternal Sonata, where you press a button to either not take damage or take minor damage. My final minor complaint is the opening animation in the intro. I know it is done by the same people who did Namco X Capcom, but it looks cheap. It matches the energy and craziness that is this game, but I think they could have used a better animation for the intro since, well, this game is published by the same company that publishes the Tales games, which have very good animation for their opening cut scenes. In the end, I really do like this game. I had a lot of fun going through the game on my 3DS. You can get this game a few different ways. You can either get the limited edition, the normal edition, or download it onto your 3DS. In fact, this game actually got me interested in checking out some of the games that these characters are from. I wanted to try out Resonance of Fate, get back into Valkyria Chronicles, see if I can find Dynamite Cop and a Dreamcast for cheap, along with Zombie Revenge and Sakura Wars to name a few of the games I want to check out. I hope we get a sequel to this game because we need more tactical RPGs that change up the formula, like this one and Valkyria Chronicles. Maybe one day, we will see the zones cross again.